SpaceX’s Falcon 9 rocket made its twenty-fifth flight – and its second of the month – on Friday, deploying Thailand’s Thaicom 8 communications satellite. Liftoff from Cape Canaveral was moved to Friday, following a scrub during Thursday’s window due to an issue with an upper stage engine actuator, before launching on Friday, along with another first stage ASDS landing success! 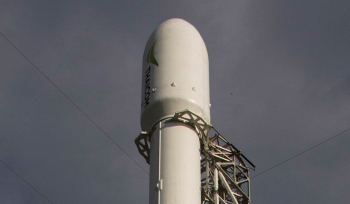 Following the successful launch of JCSAT-14 on 5 May, Falcon made another trip to geosynchronous transfer orbit to deploy Thaicom 8, the second satellite to be deployed by SpaceX on behalf of Thaicom, whose Thaicom 6 satellite was successfully deployed by a Falcon 9 v1.1 in January 2014. 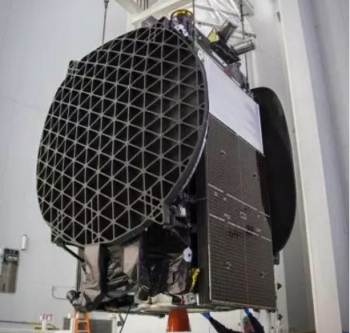 In addition, Thaicom has a long-term lease agreement in place for half of the transponder capacity aboard the AsiaSat-6 satellite, which was also launched by a Falcon 9 in 2014 and is marketed as Thaicom 7. Thaicom 8 is a 3.2-tonne (7,100 lb) communications satellite which was constructed by Orbital ATK around the GEOStar-2.3 bus, previously used for the Thaicom 6 spacecraft. Orbital were awarded the contract to build the satellite in April 2014; with the announcement that SpaceX would provide launch services being made at the same time at a total cost of $178.5 million US dollars (approximately 6.4 billion Thai Baht at current exchange rates). The satellite will be stationed at a longitude of 76.5 degrees East, alongside Thaicom 5 – which has been in orbit since its launch on an Ariane 5 in May 2006 – and Thaicom 6. Thaicom 5 has four years remaining of its fourteen-year design life, while Thaicom 6 is expected to remain in service until 2029. The Thaicom 8 spacecraft carries twenty-four Ku-band transponders which will be used to provide data relay and broadcasting to Thailand, India and East Africa. Designed for fifteen years of service, the spacecraft is powered by twin four-panel solar arrays consisting of ultra-triple-junction cells. Propulsion is provided by a BT-4 engine constructed by Japan’s IHI Corporation, with smaller monopropellant thrusters for manoeuvring and – alongside reaction wheels – for attitude control. 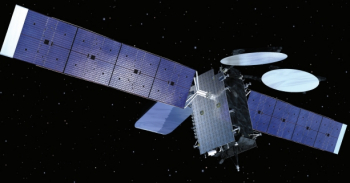 In addition to Thaicom 5 and 6, Thaicom 8 joins a fleet that includes the eleven-year-old Thaicom 4 satellite at 119.5 degrees East and Thaicom 7 – leased transponders aboard the AsiaSat-6 satellite at 120 degrees East. The launch was the thirtieth to be conducted by SpaceX and the twenty-fifth to use the Falcon 9 rocket which first flew in 2010. The company’s five previous launches, between 2006 and 2009, used the smaller Falcon 1 vehicle, which has since been retired. In the six years it has been in service, SpaceX has twice made significant revisions to the Falcon 9. Early launches used a version which has become known retrospectively as the v1.0, close to the original design with nine first stage Merlin-1C engines arranged in a square grid layout. 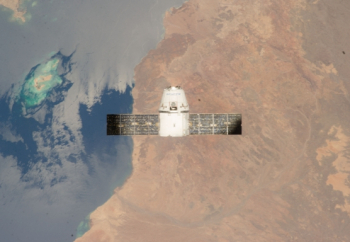 This débuted with the Falcon 9’s maiden flight in June 2010 which carried the Dragon Spacecraft Qualification Unit – a mockup of the Dragon spacecraft. The same configuration was subsequently used to launch four functional Dragon spacecraft; two Commercial Orbital Transportation Services (COTS) test flights and two operational Commercial Resupply Services (CRS) flights. The first four launches were completed successfully. The fifth launch deployed the Dragon spacecraft successfully despite a first stage engine failure, however as a result of this the second stage had to burn for longer than planned, preventing the successful delivery of an Orbcomm satellite that was also being carried by the vehicle. The original Falcon 9 was replaced by an upgraded configuration, the v1.1, which featured stretched first and second stages, improved Merlin-1D engines and a new octagonal “OctaWeb” configuration for the first stage engines. The first of its fifteen launches was the first Falcon mission to fly from Vandenberg Air Force Base in California, which deployed Canada’s CASSIOPE satellite in September 2013. 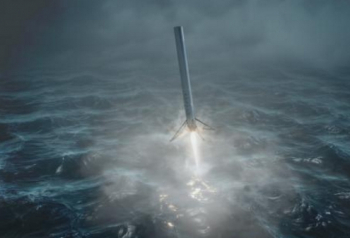 The increased performance of the Falcon 9 v1.1 allowed SpaceX to begin attempting recovery of the first stage – with early launches used to demonstrate the vehicle’s ability to restart its first stage engines and guide itself to a target point in the ocean. 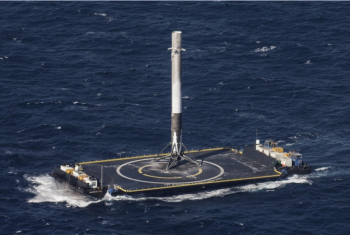 Beginning with the CRS-3 Dragon launch in April 2014 launches not requiring the rocket’s maximum payload capacity began to fly with landing gear and January 2015’s CRS-5 launch was the first to attempt landing on a platform at sea – SpaceX’s Autonomous Spaceport Drone Ship (ASDS) – although the stage landed hard and exploded. A further recovery attempt during April 2015’s CRS-6 launch was also unsuccessful with the stage toppling over after touchdown. During the launch of CRS-7 in June, the Falcon’s second stage suffered a structural failure after a helium tank broke loose and overpressurized the stage’s oxidiser tank. When the Falcon returned to flight the following December another new configuration was introduced, the Falcon 9 “Full Thrust” which has also been known informally as the Falcon 9 v1.2. Its first launch orbited eleven Orbcomm spacecraft with the first stage returning to Cape Canaveral for a successful landing at the former Launch Complex 13 which had been converted to accept returning Falcon vehicles. In January. 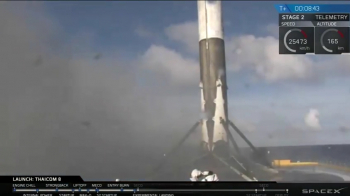 the final Falcon 9 v1.1 orbited the Jason-3 climate research satellite but again an attempt to recover the first stage at sea failed, with a landing strut failing to lock which caused the rocket to topple over at touchdown. The “Full Thrust” version of the Falcon 9 uses uprated first stage engines, supercooled liquid oxygen which is denser than that used aboard the v1.1 – allowing more to be carried – and a further stretched second stage. These enhancements increase the overall payload capacity of the rocket and allow recovery attempts to be made on launches that would have previously required the full performance of the vehicle, such as geosynchronous missions like the current flight. The Thaicom 8 launch was the fifth to use the “Full Thrust” Falcon, with recovery attempted downrange using the ASDS, named “Of Course I Still Love You”. The last three launches – which carried SES-9 in March, CRS-8 in April and JCSAT-14 earlier this month have all attempted first stage landings on the ASDS with two landing successfully. SpaceX characterises the landing attempts as experimental and does not expect every one to be successful – particularly with geosynchronous launches where the stage separates at higher velocity and is subject to more extreme heating during reentry. As a result, during the SES-9 landing attempt the first stage landed hard and exploded. 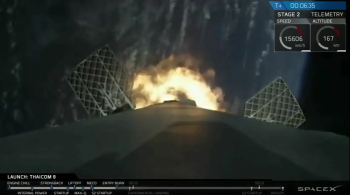 The JCSAT launch has shown that it is possible for the stage to make a successful landing following a geosynchronous mission, and with Thaicom 8 a lighter payload than JCSAT-14 there was cause for optimism about the attempt. Despite it still being unlikely to make a successful return, the first stage once again nailed the landing on the ASDS, marking yet another milestone for SpaceX. The launch began with ignition of the nine Merlin-1D engines of the rocket’s first stage, three seconds ahead of its planned liftoff at the zero mark in the countdown. The delay between ignition and liftoff allows the engines to build to full thrust, and the flight computers to abort the launch should an anomaly be detected at startup. Both stages of the Falcon 9 burn RP-1 propellant, oxidised by liquid oxygen. Seventy-seven seconds into flight the rocket passed through the area of maximum dynamic pressure, or Max-Q. At two minutes and 35 seconds elapsed time the first stage shut down, having completed its role in boosting Thaicom 8 towards orbit. Four seconds later the first and second stages separated, with the second stage continuing to orbit with its payload and the first stage beginning its descent towards Of Course I Still Love You. Seven seconds after stage separation the second stage’s Merlin Vacuum engine ignited for the first of two burns. Lasting six minutes and ten seconds this established the vehicle into an initial parking orbit. About 51 seconds into the burn, the payload fairing separated from the nose of the vehicle. 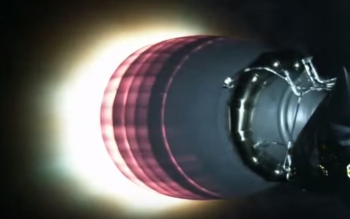 The second burn of the second stage lasted seventy-three seconds, after an 18-minute, 11-second coast phase. Spacecraft separation occured at 31 minutes, 57 seconds mission elapsed time; three minutes and 36 seconds after the end of powered flight. Falcon delivered Thaicom 8 to a geosynchronous transfer orbit, with the satellite using its own BT-4 engine to raise itself to geostationary orbit. While the second stage was making its first burn, the first stage will perform a series of three manoeuvres to attempt its landing. A reentry burn slowed the stage as it entered the atmosphere, and a landing burn in the final seconds before touchdown softened the landing – which occurred eight to ten minutes after liftoff. 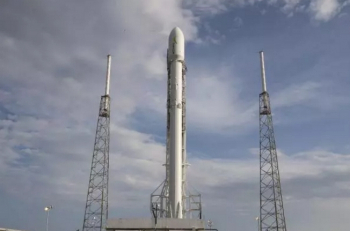 This was yet another successful recovery for SpaceX. The launch was the fifth of the year for SpaceX, the eighth for the United States and the thirty-first or thirty-second worldwide – as it remains unclear whether a launch conducted by Iran last month was a successful suborbital launch or an unsuccessful attempt to orbit a satellite. The next Falcon 9 is scheduled to launch in mid-June, with the Eutelsat 117 West B and ABS-2A satellites aboard.